Office 365 includes all the business values of BPOS such as no server upgrades, 24x7 technical support, predictable price and familiar experiences. On top of that there are new features and offerings that extends the functionality of BPOS. At some point, all BPOS customers will transition to Office 365. The time of the transition will be scheduled by Microsoft and customers have to respond to those schedule proposals. During the transition, all changes within the Microsoft datacenters will be done by Microsoft, so there will be no data migrations required by customers. In addition it is guaranteed that the transition will cause no interruption to the mail flow. 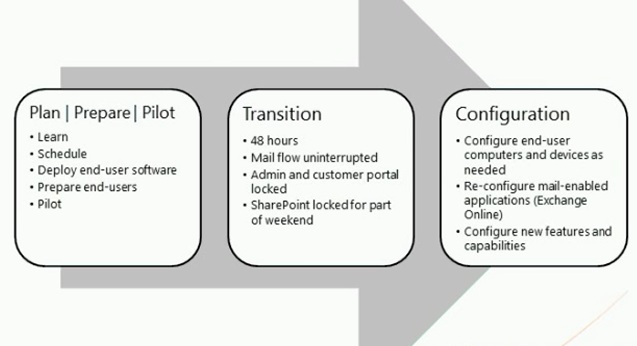 Key areas of change includes added new features, new offerings, SharePoint Online Deskless Worker deprecation, transition from Live Meeting to Lync Online, new system requirements, new portal experiences, URL changes for OWA and portals, Services Connector which will replace the Microsoft Online Services Sign In application, optional feature of Federated Identity and Rich Coexistence. In Office 365 there are some key changes to the system requirements. The highlights of the changes are that with the new service, Office 2003, IE 6 and Office Communicator 2007 R2 are not supported. From the pricing and licensing aspect, all active BPOS subscriptions will be transitioned to Office 365. also for existing BPOS customers there will be no changes to agreements, contracts, account status, etc. Customer can switch offerings after the transition is completed. As mentioned, Live Meeting will be transitioned to Lync Online. After the transition, Lync Online becomes the conferencing solution meaning that Lync Online replaces Live Meeting and Live Meeting will be phased out. From the customer's prospective, all BPOS customers require to remove Live Meeting Outlook add-in and install Lync Online Outlook add-in instead.